Welcome to the official website of the Portland Plaza Unit Owners Association. If you are a resident, please login at the top right corner to have full access to all our features. If you are browsing our site and have questions, please follow the Contact Us link on the menu. 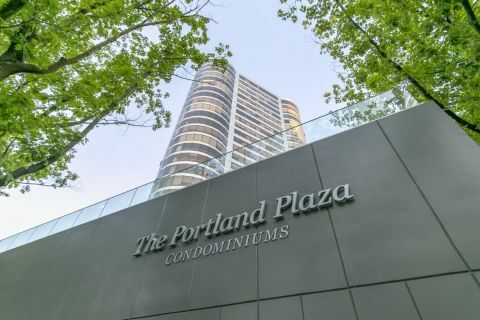 The Portland Plaza: “What a great shape to be in!” The award-winning, triangular design provides every condominium with a 230-degree panoramic vista! Most of the 144 units are a spacious 2-bedroom, 2-bath, 1319 square feet, with full-length glass windows. Outside, the exterior of glass and aluminum give The Portland Plaza a contemporary, ageless feel. When proposed in 1971, The Portland Plaza was to be the 4th tallest building in the Portland, Oregon, skyline at 25 floors, 267 feet. 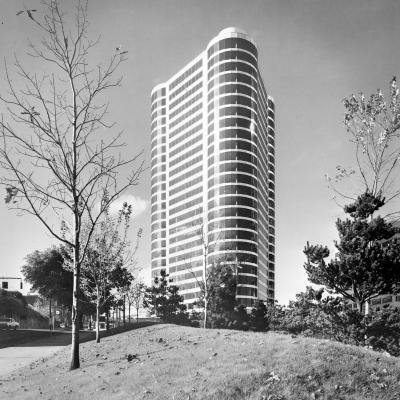 Advertised as, “The Shape of Things to Come,” it was the first in Portland designed exclusively as “condominium apartments” for luxury high rise living. Construction was completed in 1973 with full-occupancy in 1974. The Portland Plaza sits just west of Portland’s Keller Auditorium and the Ira Keller Fountain, a focus of early controversy. From 1972-1973, the Plaza’s design was criticized for fear it would not compliment the fountain—itself of world-renown design. Concessions included a decision to forego construction of a 2nd tower planned for the block just south of The Portland Plaza. Everything is close! The Portland Plaza is ideally located in downtown Portland, Oregon, just south of the primary business, shopping, and entertainment districts. It is distinct in its proximity to Portland’s Cultural District—the Keller Auditorium, Arlene Schnitzer Concert Hall, Portland Art Museum, Portlandia sculpture, and live theater. With a Walk Score of 100, and Rider and Biker Scores of 91, this is a totally accessible residential location. Everything you need is within a 20-minute walk, 5-minute car trek, or 10-minute bike or transit ride. Portland’s Transit Mall—hub for MAX, busses, and the streetcar—runs right in front of The Plaza! Ramps to Highway 26, Interstates 5, 84, and 405, and the bridges, are all within blocks. Also close by are the Portland Waterfront and Portland State University—both vibrant year-round. Downtown shopping and the Pioneer Place Mall are walkable. Business, work, and health to manage? Government offices, churches, fitness facilities, the Central Library, and Portland’s Financial District are all close, as are hospitals and medical centers. And dining of every type is just outside the door—from 5-star restaurants to 5-dollar food carts! Unique when built, and especially now, The Portland Plaza encompasses a full city block of residential-only living. Two-bedroom units are the norm—only six per floor—creating small neighborhoods within. The Plaza’s triangular shape, and perfect placement, mean four units on each floor face Mt. Hood and the Willamette River. And, oh, the views! Sunrise, sunset, boats, cars, people, bridges, bikers, downtown, the West Hills, and miles in every direction! Even rainy days are beautiful from within in The Portland Plaza. Views may be shared, but interiors are distinct. Homes range from well-kept originals (love that black and white bathroom tile!) to luxury remodels. Classic to contemporary, drapes or blinds, white to stainless, office or guest room—each home reflects the needs and style of its owner. Residents also enjoy ample common space—the gym, fountain, pool, library, meeting room, kitchen, and lobby, complete with WiFi access. Vehicles and bikes are tucked away in two levels of underground parking. And privacy? The building’s concrete core and special sound-reduction construction assure peace and quiet unmatched in current-day construction. The Portland Plaza is professionally managed by Coast Real Estate Services. Coast specializes in condominium and apartment management, and promotes service, value and options in its multi-disciplined approach. An on-site, full-time building manager, and 24/7 front desk concierge services ensure the building and residents are well taken care of. The Portland Plaza Board of Directors oversees the Association’s business, supported by committees of proud and enthusiastic volunteer owners. Portland Plaza residents are neighbors—the kind of great neighbor you’d hope for in your community!